Saint Jude (1st century C.E. 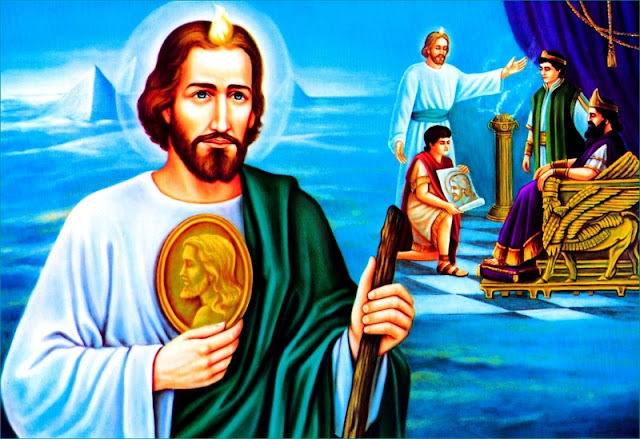 ), also known as St. Judas or Jude Thaddeus, was one of the Twelve Apostles of Jesus, who is sometimes, the author of the Epistle of Jude. Mark and some manuscripts of Matthew identify him as "Thaddeus." Luke names him as Judas, son of James, or in the King James Version: "Judas the brother of James" (Luke 6:16). Biography St. Jude was born into a Jewish family in Paneas, a town in Galilee later rebuilt by the Romans and renamed Caesarea Philippi. In all probability he spoke both Greek and Aramaic, like almost all of his contemporaries in that area, and was a farmer by trade. St. Jude was a son of Clopas and his wife Mary, a cousin of the Virgin Mary. Tradition has it that Jude's father, Clopas, was murdered because of his forthright and outspoken devotion to the risen Christ. Tradition holds that Saint Jude preached the Gospel in Judea, Samaria, Idumaea, Syria, Mesopotamia and Libya. He is also said to have visited Beirut and Edessa, though the latter mission is also attributed to Thaddeus of Edessa, one of the Seventy. He is reported as suffering martyrdom together with Simon the Zealot in Persia. The fourteenth-century writer Nicephorus Callistus makes Jude the bridegroom at the wedding at Cana. Though Saint Gregory the Illuminator is credited as the "Apostle to the Armenians," when he baptised King Tiridates III of Armenia in 301 C.E., converting the Armenians, the Apostles Jude and Bartholomew are traditionally believed to have been the first to bring Christianity to Armenia, and are therefore venerated as the patron saints of the Armenian Apostolic Church.